Rick Welliver (right) is the subject of Justin Whiteman's insightful documentary Keep Your Hands Up. One day, an affable guy named Rick Welliver interrupted Justin Whiteman's cup of coffee, asking the filmmaker, "What's your story?" From there, the two became fast friends. "Rick is one of my best friends, and he's one of many people's best friends," says Whiteman, a son of Spokane who now resides with his wife in Milwaukee. "He's one of those larger-than-life personalities." 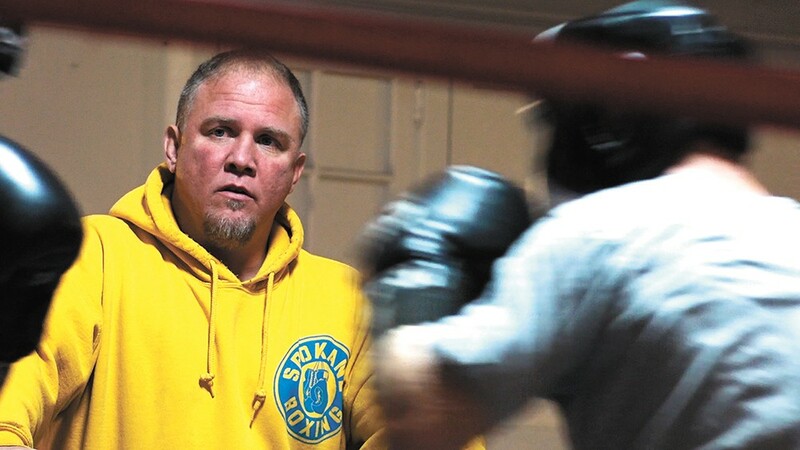 Welliver's gregarious sociability and passionate disposition is the stuff of legend in local boxing circles, but Whiteman, a storyteller by trade, saw an opportunity to paint a more nuanced portrait of the man and his obsession, Spokane Boxing. The result is a tender and revelatory short documentary called Keep Your Hands Up. "No infomercial here," Whiteman cautions. "This isn't a best-buddy piece. Let's peel that notable uniqueness away and see him in a subtly but distinctly different light, and quietly get into the heart and soul of him." Welliver, known as "The Pitbull" during his heyday as a cruiserweight professional boxer, wears that heart on his sleeve. "We've forgotten as a society how to make kids feel special," he argues. "I just know that we need to give kids more options. Boxing saved my life. And if it wasn't for my father putting boxing into my life, I'd be in prison. Something would be amiss." In the film, Welliver calls his father "my first hero, my first friend, my first everything." The reverence for his old man, himself a former boxer, provides a kind of template for Welliver's devotion to the local youths who come to his gym in search of a coach, in search of a mentor, in search of a hero. "Is there a love of service? Absolutely. Is there a love of boxing? Absolutely. He's not doing this for the money," says Whiteman. "He's doing this to impress his dad, and that's so interesting to me. We're all trying to impress that ghost." Keep Your Hands Up is "intentionally raw," says Whiteman, a "real gritty piece" that he hopes sheds light on Welliver's work and the boxing scenes in Spokane and Wallace, Idaho, where some of the scenes were filmed. At the least, it was a chance to return to his beloved hometown, his "creative Mecca," that has served as the muse for so many of his films. "For years I felt like the luckiest kid on the block," says Whiteman. After graduating from the University of Washington, he migrated to Los Angeles and began his love affair with filmmaking. He wrote scripts, enrolled in acting classes, worked on sets and escaped back to Spokane intermittently in pursuit of inspiration. His first foray into directing, for his satirical 2001 mockumentary Newtown, was a breakthrough. "It established me as someone who could write and work with actors and put a team together and tell a story," says Whiteman. "So from then on I've called myself a filmmaker." An MFA in film direction from the American Film Institute then morphed into a five-year stint in the Navy as a mass communications specialist (he was hailed as "Outstanding New Broadcaster of the Year" for his work covering military exercises in the Pacific), which, through the GI Bill, paved his way to a master's degree from UC Berkeley's Graduate School of Journalism. Keep Your Hands Up, Whiteman notes, was created "with much support and encouragement" from the school, particularly his mentor, television producer Bob Calo. Now, his work is tied to the storied tradition of moviemaking in Spokane and to SpIFF, which is presenting the film in its Emerging Filmmakers Showcase. Whiteman plans to attend both the screening and the Q&A to follow. Keep Your Hands Up screens as part of the Emerging Filmmakers Showcase on Sat, Feb. 4, at 4 pm at the Magic Lantern Theatre (25 W. Main).